If you’re reading this report make sure to watch the video (set to Full Screen/1080HD). It’s set up as a tour that portrays the day better than words. I love it when a good plan gets better. 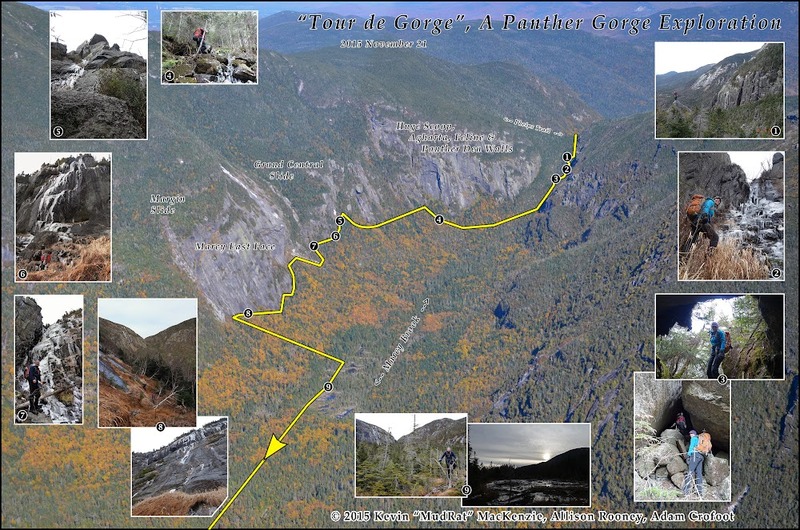 My original itinerary was to relax and explore the gorge, to reconnoiter the cliffs between Marcy’s East Face and the multi-pitch walls of the north end where I spent much of the summer. I also wanted to bushwhack around the talus below. I hoped to then skulk around the crags on Haystack and exit. Adam, Allison and I met at 5:00 am in Keene Valley. As we walked under the glow of headlamps he mentioned exiting to the south then climbing Marcy before heading back to the Garden. It sounded great to me and it was easy to reorganize the original route to suit our individual desires. We’d drop down along the Haystack side in the north, cross to the Marcy cliffs and see how things went. Good things rarely come easily, great things sometimes ache a bit afterward...well, we had a great day. I often joke that the best hikes begin and end in the dark. The woods were still filling with light as we passed Johns Brook Lodge. I admit that I was thrilled to be spending a day with a light load compared to the usual 45-pound climbing pack. I was also relieved to have a relatively sane agenda as opposed to fitting a climb in once at the gorge. I could let down my guard from a mental perspective. A veneer of ice on the rocks began a little above Slant Rock after about 7 miles of walking. We had microspikes, but didn’t bother using them. We topped the north pass of the gorge around 9:00 am. and entered the balsam forest. We decided to stay close to the bottom of the broken crags on the Haystack side. This kept us above the large moss-covered blocks in the drainage. Boulders fallen in ages past are common, but a select few tower above the treetops. There were two of interest to me. We spied one from the base of a cliff and struck a heading toward its triangular peak. I stayed behind to photograph from a distance as Adam stood on its top. The gorge dropped away behind. A person looks small in contrast to the nearly 200 acres of cliff-surrounded forest that make up the gorge (acreage based on following the 3,600 foot elevation contour from the Elk Lake to Marcy Trail to the Phelps Trail [including the thin tract of forest in the north pass above 3,600 feet in elevation). We went over to the Ramp Wall, an area we “opened” on May 30, 2015. The “All Battered Boyfriends” route sat just above as we looked at the ice starting to build—it is a wall with a lot of seepage. The name as mentioned in a previous report came from the fact that Adam’s eye and my groin were adversely affected by a branch snapping back from Allison and her fist (respectively). There’s a point here that I’ll get back to in a few paragraphs. We followed a rugged drainage full of deep talus caves down to the next obvious boulder on the Haystack side. It is the size of a house and I’ve been curious about it for years. Ah, the sound it must have made as it fell from the cliffs. There’s a crack running up an overhang on its west side so it would make a great boulder problem and kudos to anyone willing to take a bouldering pad into the gorge! We descended along its north side; Adam disappeared around a corner under the overhanging section. What a cool area. Around the next turn came a surprise. This boulder was laying snug against another slightly small one. Underneath was a cave/passage. Rubble littered the ground in front. I pulled the camera out, set it to video and followed Allison in as we muttered comments about how pretty it was inside. The markings, colors and chock stones in the ceiling all made it a unique side trip. A rubbly floor and piles dead sticks pointed to the fact that it must have significant water flowing through it at various times. 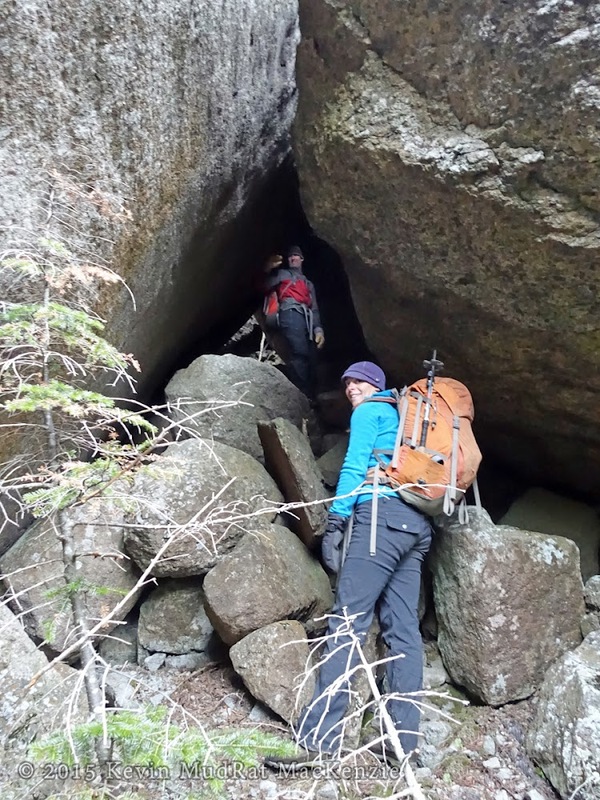 Entering the passage under the boulder on Haystack. The next stop on our tour was along what we’ve dubbed the Shield Wall. It’s an obvious section of steep blank slab. Adam and I began exploring along its base in 2013 when we followed south to a broken wall in the shape of a “V” (has a gully on the left and trap dike on the right). The woods to the Shield’s north were steep and semi-loosely knit with many cedars. By now Allison was in the lead and I heard her yell out. We rushed up and she was spouting a few explicatives and in pain; a branch had stabbed deep into her ear. She described a pulsing sound along with the pain. We looked for blood, worried it had perforated her ear drum. There was none. She’s tough as nails so we continued after a snack. Perhaps another route next year can be named, “Panther Battered Girlfriend” or something similar. It is easy to get “cliffed-out” in this area and we each took separate tracks. Allison stayed low, I cut down the center and Adam walked a bit higher. I found a way down the ledges, slipped and found myself hanging upside down by my ankles...chuckling like an idiot. I freed myself and dropped to the base then walked over below a steep slab near the Shield. The forest below had been blasted sometime in the last 10 or so years. It was obvious what happened. A refrigerator sized boulder fell from above, hopped the slab (no scrape marks) and landed in the woods. It was sitting in the center of a small crater. The impact had scattered smaller stones and taken down the trees in the surrounding area. I find it interesting to stumble upon these areas and see how powerful nature can be. This type of thing obviously occurs frequently especially when thinking in terms of geologic time. Speaking of time, it was nearly 11:30 am. and time to bushwhack across the gorge to Marcy’s smaller 1-pitch cliffs (think 100’ high) south of the larger walls. We have explored some of them, but there were several we wanted to study more closely for ice and rock climbing route possibilities. Ledges south of the Huge Scoop. The streams were icy and slippery with verglas as we ascended toward a blocky area south of the Huge Scoop wall (see the “Rumours of War” or “The Pride” reports). 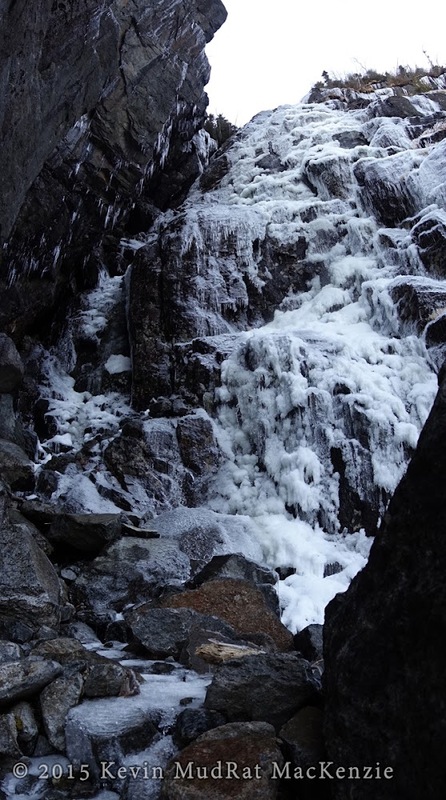 Frozen waterfalls and small cascades decorated the landscape. 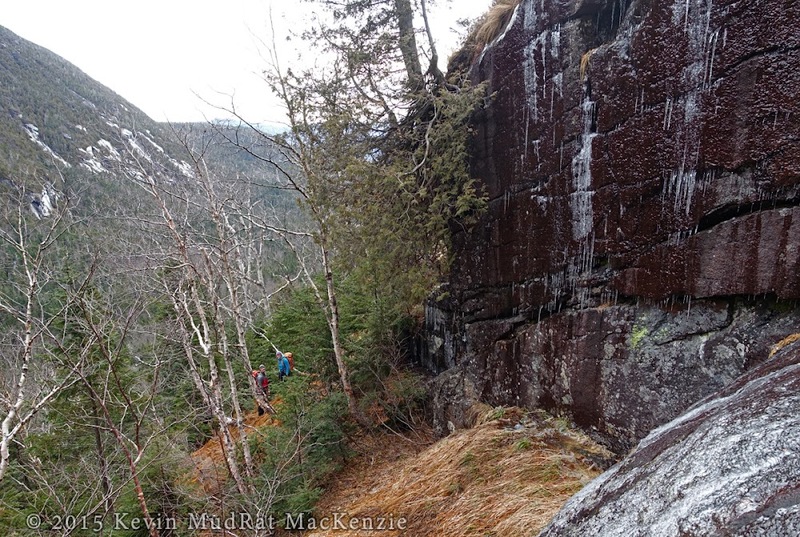 Bushwhacking on contour led to a slide to the south topped with an overhang. This was our “Pi Day” route, an ice route we added last March on Pi Day. It was just beginning to form. Allison and Adam talked below while I walked under an icicle-fringed overhang and shot more video. There’s an extended section in the video above that captures the serenity of where we were. Yup, we'll be back to this line. 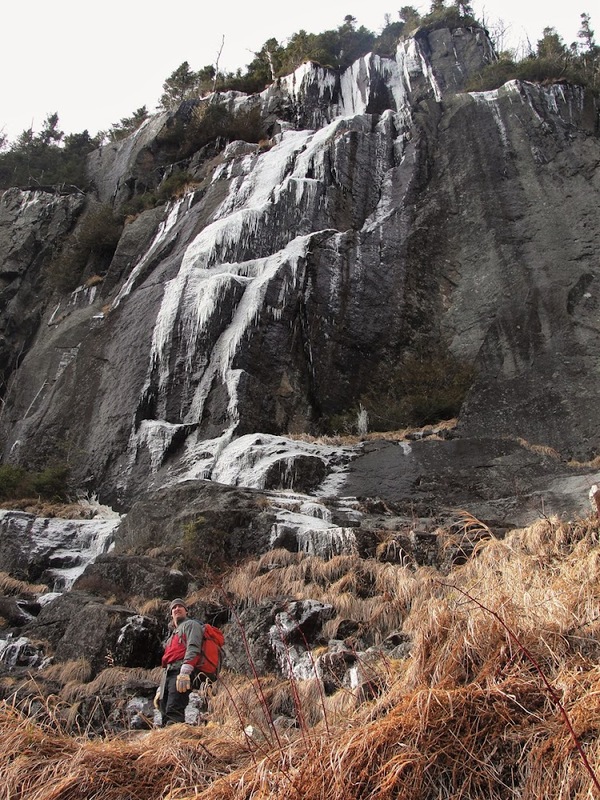 We walked up a gully and explored then descended along terraced cliffs with cracks, overhangs and other features that tickled our curiosity further. This gave us justification to come back with climbing gear. Darn, another excuse to visit the area! Continuing south we eventually found the ledges preceding Grand Central Slide. I heard the rush of water. Allison arrived first and yelled something—base on her tone she was in awe at the sight of the falls. The wall on the left is about 100 feet high and overhangs to the right above a cleft that splits the ledges. The adjacent face was covered in cauliflower ice with water running underneath. Every now and again a small piece would bounce down—the sun was warm. I’ve visited the falls well over a half dozen times. I simply love the and always find it hard to leave, but we still had much ground to cover. To continue south, you must descend the drainage about 100 vertical feet to get around a buttress. 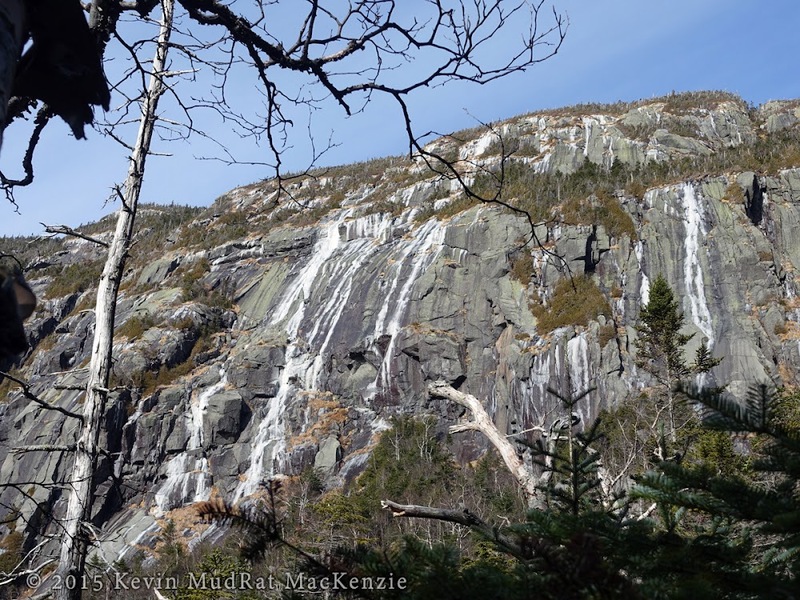 Once around, you are at the bottom of a 2012 rockfall that cleared the woods at the bottom right of Marcy’s East Face. We climbed the rubble and worked our way along the grassy slanted base of the face. Ice lines had begun to form above. They also decorated the walls of Haystack and the slides on it to the south. 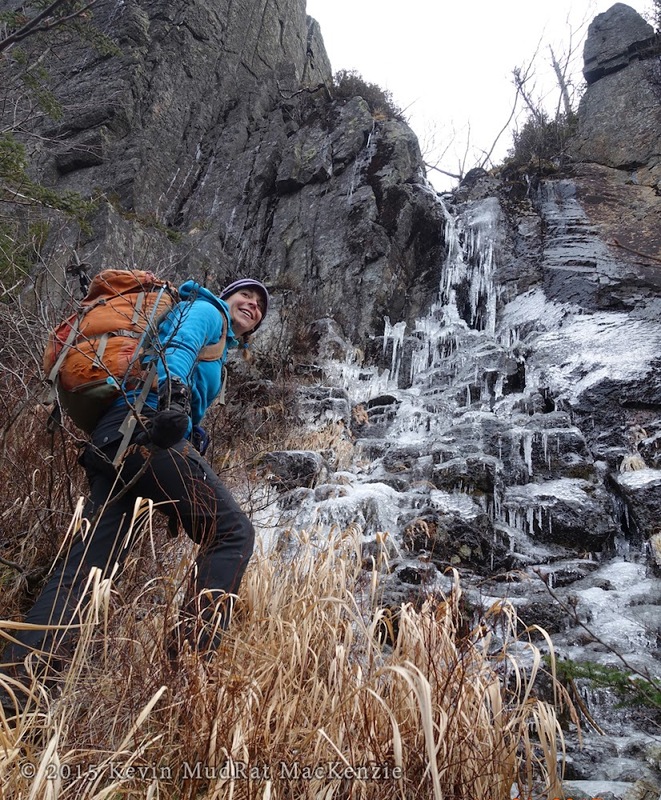 Bushwhacking is easy along the face as long as one takes care to listen for any ice that may be sliding down—after all, there’s a clear border between the stone and forest for a reason. We relaxed once at the Margin Slide near two deer beds—depressions in the grass. As I shot more video, Allison said, “We should call this ‘Tour de Gorge’”. The name stuck—perfect. The time was approaching 3:00 pm. It was time to enter the forest once again, but the tour wasn’t over. 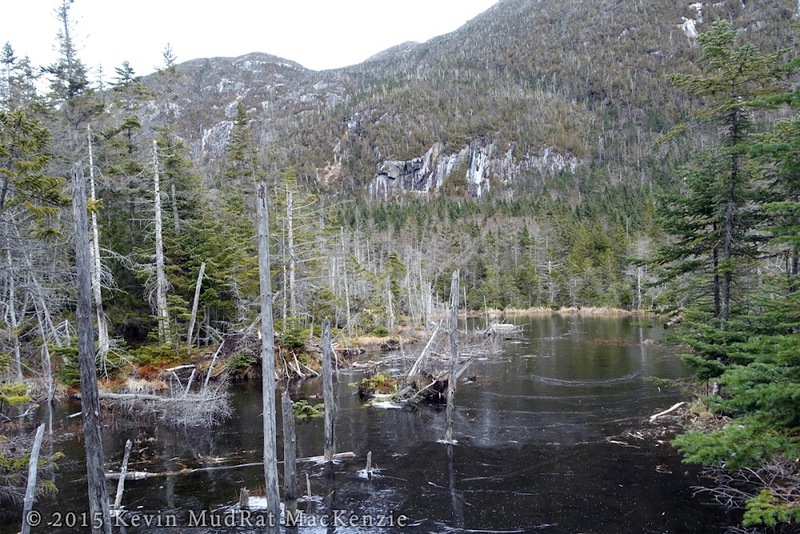 We still wanted to explore the beaver ponds before exiting to the Elk Lake to Marcy Trail. I have yet to find an easy route down from this area yet so we simply struck a line-of-sight heading to the northern pond. Into the fray we went. The theme was tight balsam forest littered with talus (talus is everywhere below each cliff—again, makes sense). We balanced on deadfall and crossed a few substantial blowdown fields—there are several fields in the gorge, including a ring from a downburst on the Haystack side. I found a surprise at the ponds. The northern pond was full! Two years ago it was devoid of beaver activity. We found cut trees, wood chips and a well-used beaver slide/path. The chips were next to an erratic that Anthony Seidita and I sat upon for lunch back in 2013. Several hundred feet to the south we found another pond, one of the largest. It was not full and a thin sheet of ice rimmed the edges. The ice crackled as we walked while the sun disappeared behind Skylight. 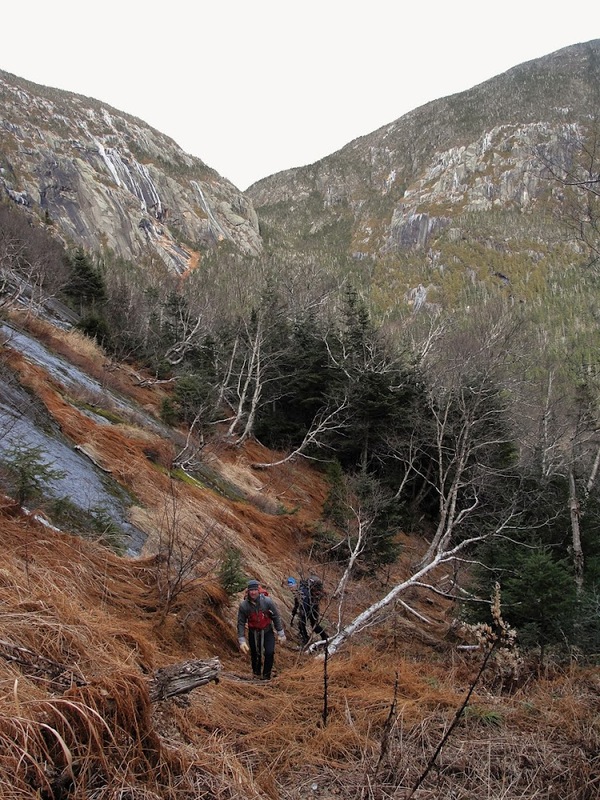 We began the bushwhack to the south navigating blowdown fields, dense balsams and a few areas of loosely knit forest. Allison found a deflated balloon with the word “Frozen” on it (from the movie). We tucked it in her pack. I chuckled because Anthony found a “Happy Birthday” balloon a few years ago. A bit farther along, we crossed a small stream that drained the Old Slide on the south of Marcy. Soon we were at Marcy Brook. We spend about 30 minutes paralleling it; Adam on its west side and Allison and I to the east. He found the path of least resistance. She and I used brute force tinged with a bit of stubborn tenacity in our bushwhacking strategy. We soon caved in and crossed to Adam’s position where we found an intermittent herd path. Two hundred feet farther let to the trail where we took a 3 minute break before ascending to 4-Corners. The trail climb drained my energy, I’d mismanaged my food slightly. Consolidated snow along the edges aided us near the top. Dusk had overtaken the forest so it was difficult to differentiate verglas from rock. We changed to microspikes just above 4-Corners. A weather front was moving—more perfect timing. A relatively calm day was now windy and cold. We broke treeline and it was completely dark with gusts that made footing difficult in microspikes on bare rock. I live for this stuff! We reached Marcy’s summit at 5:45 pm. though I yelled 6:45 in the video—oops. Only 9.5 miles to the car. The other side of Marcy was loaded with neve and thick bullet-proof ice. A careful descent led back to the verglas covered trail where poor footing slowed our pace. We need snow to fill in the trails—and soon. The exit was slow and deliberate, but uneventful. A full 18 hours later at 11:10 pm. we arrived at the car and finished the day. It was a relaxing Panther Gorge day with the crux on Marcy, a rare day when we didn’t carry a plethora of heavy gear. Those days will arrive soon as the adventures continue. 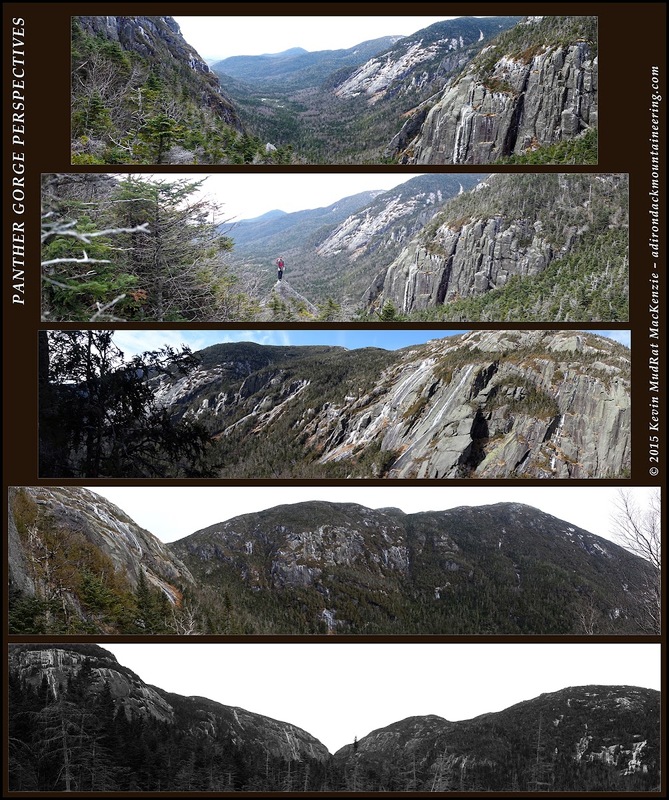 Below, View from north end, Adam on the small boulder, Marcy Walls, View of Haystack, View North from the Ponds.